Taiwan Province ( Chinese: 臺灣省; Pinyin: Táiwān Shěng; POJ: Tâi-oân-séng; PFS: Thòi-vàn-sén or Thòi-vân-sén) is a province of the Republic of China without administrative function. Its administrative powers have been transferred to the central and county governments. Taiwan Province covers approximately 69% of the actual-controlled territory of the Republic of China, with around 31% of the total population. The province initially included the island of Taiwan (Formosa), Penghu (the Pescadores), Orchid Island, Green Island, Xiaoliuqiu Island, and their surrounding islands. Between 1967 and 2014, six special municipalities ( Kaohsiung, New Taipei, Taichung, Tainan, Taipei and Taoyuan) were split off from the province, all in the most populous regions. In 1683, Zheng Keshuang (third ruler of the Kingdom of Tungning and a grandson of Koxinga), surrendered to the Qing following a naval engagement with Admiral Shi Lang. The Qing then ruled the Taiwanese archipelago (including Penghu) as Taiwan Prefecture of Fujian Province. In 1875, Taipeh Prefecture was separated from Taiwan Prefecture. In 1885, work commenced under the auspices of Liu Ming-chuan to develop Taiwan into a province. In 1887, the island was designated as a province (officially Fokien-Taiwan Province [ zh]), with Liu as the first governor. The province was also reorganized into four prefectures, eleven districts, and three sub-prefectures. The provincial capital, or "Taiwan-fu", was intended to be moved from the south (modern-day Tainan) to the more central area of Toatun (modern-day Taichung) in the revamped Taiwan Prefecture. As the new central Taiwan-fu was still under construction, the capital was temporarily moved north to Taipeh (modern-day Taipei), which eventually was designated the provincial capital. The ROC government immediately established the Taiwan Provincial Government under first Chief Executive and government-general Chen Yi in September 1945. Chen was extremely unpopular and his rule led to an uprising – the February 28 Incident of 1947. Chen was recalled in May 1947 and the government-general position was abolished. In 1992, the post of the governor of the province was opened to election. The then-opposition Democratic Progressive Party (DPP) agreed to retain the province with an elected governor in the hopes of creating a " Yeltsin effect" in which a popular local leader could overwhelm the national government. These hopes proved unfulfilled as then-Kuomintang member James Soong was elected governor of Taiwan province, defeating the DPP candidate Chen Ding-nan. The position of the Chairperson of the Provincial Government, appointed by the central government, is retained to comply with the Constitution. 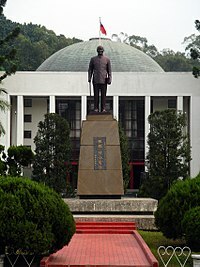 The Taiwan Provincial Government was located in Zhongxing New Village, Nantou City, Nantou County between 1957 and 2018. In October 1945, The government of the Republic of China reformed the eight(8) Japanese prefectures under the Government-General of Taiwan into 8 counties and 9 cities. Counties: Hsinchu, Hualien, Kaohsiung, Penghu, Taichung, Tainan, Taipei, and Taitung. Cities: Changhua, Chiayi, Hsinchu, Kaohsiung, Keelung, Pingtung, Taichung, Tainan, and Taipei. Cities: Kaohsiung, Keelung, Taichung, Tainan, and Taipei. December 25 16 3 All county seats (originally urban townships) upgraded to county-administered cities. which covers 4 counties (Kaohsiung, Taipei, Taichung, Tainan) and 2 cities (Taichung and Tainan). 2014 December 25 11 3 Upgrade Taoyuan to a special municipality. Currently, the Taiwan Province is divided into 11 counties and 3 cities . All divisions are directly administered by the central government, although nominally it is still a part of the province. Note that the special municipalities of Kaohsiung, New Taipei, Taichung, Tainan, Taipei and Taoyuan are both nominally under and directly administered by the central government. They are not part of any province. The People's Republic of China (PRC) regards itself as the " successor state" of the Republic of China (ROC), which the PRC claims no longer legitimately exists, following establishment of the PRC in mainland China. The PRC asserts itself to be the sole legitimate government of China, and claims Taiwan as its 23rd province, even though the PRC itself has never had control of Taiwan or other ROC-held territories. The ROC disputes this position, maintaining that it still legitimately exists and that the PRC has not succeeded it to sovereignty. The Senkaku Islands, which are currently administered by Japan, are disputed by both the ROC and PRC, which claim them as the Tiaoyutai/Diaoyu Islands. The ROC government claims them as part of Toucheng Township, Yilan County. ^ "Taiwan Provincial Government Official Website". Retrieved 17 July 2018. ^ Davidson, James W. (1903). The Island of Formosa, Past and Present : history, people, resources, and commercial prospects : tea, camphor, sugar, gold, coal, sulphur, economical plants, and other productions. London and New York: Macmillan & co. p. 244. OL 6931635M. During the French war, Liu Ming-chuan had been placed in sole command, responsible only to the central authorities. Under his superintendence, Formosa had been carried safely through the war, and it was now apparent that the exigencies of the times required that the island should be made an independent province, and that officials of high rank and undoubted ability should be henceforth placed in charge of it. Therefore, in 1887, the island was declared by Imperial decree an independent province, and the Imperial Commissioner Liu Ming-chuan was appointed the first governor. ^ Davidson (1903), p. 244: "A thorough reorganization and redivisioning of the island was now necessitated. In former days, Formosa comprised one complete prefecture, four districts, and three sub-prefectures. Now the island became a province with four prefectures (Taipeh, Taiwan, Tainan, and Taitung), eleven districts, and three sub-prefectures." ^ Campbell, William (1915). "Chapter XLIV: A Retrospect and a Forecast". Sketches from Formosa. London: Marshall Brothers. pp. 278–9. OL 7051071M. ^ Davidson (1903), pp. 244–5: "As a result of these changes and additions, the seat of government (which had been formerly at the old town of Taiwan-fu in the south, which city had been in turn the capital of the Dutch, Koxinga, and the Chinese,) was now removed temporarily to the new city of Taipeh, which had been lately in course of construction...In connection with this, it is necessary to go further and explain that it was the intention of the government to build a new capital city in the centre of the island near Changwha. Accordingly, the new city was laid out and the construction of official yamens commenced. The name of the new city became Taiwan-fu, or the capital city of Taiwan (Formosa), and it was also to be the seat of a new prefecture called Taiwan [Prefecture]." ^ "Welcome to the Ohio Department of Development". Archived from the original on 2009-06-17. Wikimedia Commons has media related to Taiwan.